A drug like candidate should have the properties to completely eliminate the parasite either through activation of macrophages or by directly acting on parasite. 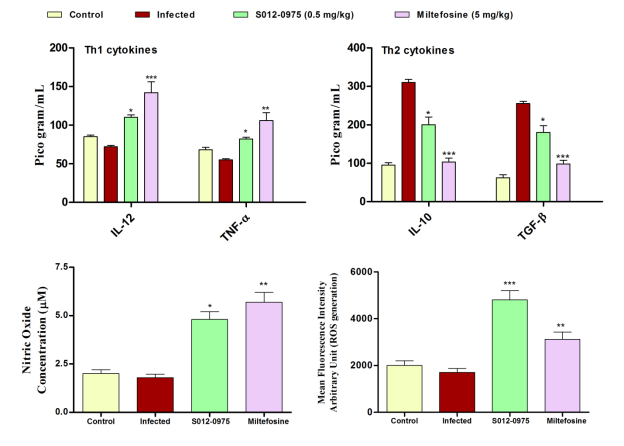 Cure in visceral Leishmaniasis is observed by the production of Th1 cytokines, IFN-γ, IL-12 and TNF-α and enhanced production of reactive oxygen and nitrogen species and disease progression through augmentation of Th2 cytokines like IL-10 and TGF-β and production of negative regulators like PGE2 and SHP-1. A combination of immunomodulator’s and a chemotherapeutic drug’s property may provide a good chemotherapeutic intervention for unleashing the deprived immune status and clearance of parasite from host. In order to elucidate the mode of action of S012-0975, Th1/Th2 cytokine profiling and ROS and NO studies were done in vitro. 1. Coating Buffer- (1 L; pH to 9.5) 0.1 M Sodium Carbonate, pH 9.5, 8.40 g NaHCO3, 3.56 g Na2CO3 Freshly prepare or use within 7 days of preparation, stored at 2-8 °C . 2. Assay Diluent– PBS with 10% FBS (1 L; pH 7.0), Phosphate-Buffered Saline: 80.0 g NaCl, 11.6 g Na2HPO4, 2.0 g KH2PO4, 2.0 g KCl, Freshly prepare or use within 3 days of preparation, with 2-8°C storage. 3. Wash Buffer – PBS with 0.05% Tween-20. Freshly prepare or use within 3 days of preparation, stored at 2-8°C. 4. Substrate Solution– Tetra methyl benzidine (TMB) and Hydrogen Peroxide. Cytokine generation with effect of S012-0975 in J774.A1 cells was determined by using ELISA Kit (BD) as per kits instructions. Briefly, 1 x 106 J774.A1 cells were layered in 24 well plates were infected with DD8 promastigotes in 1:10 ratio. After overnight incubation S012-0975 was added at a dose of 150 nM, after 48 hrs of drug addition cell soup was collected and analysed for level of Th1 and Th2 cytokines. 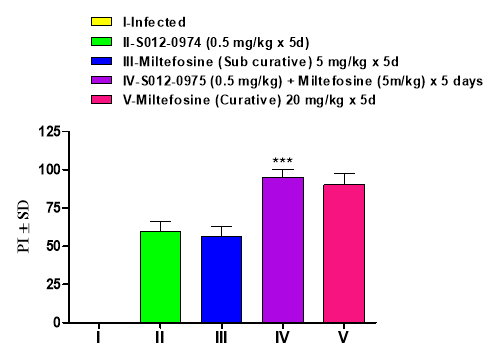 For each cytokine standard graph was plotted and calculated for their respective level. 1. Add 100 μL diluted Capture Ab to each well. Incubate overnight at 4° C.
2. Aspirate and wash 3 times. 3. Block plates: 200 μL Assay diluent to each well. Incubate 1 hr RT. 4. Aspirate and wash 3 times. 5. Add 100 μL standard or sample to each well. Incubate 2 hr RT. 6. Aspirate and wash 5 times. 7. Add 100 μL diluted Detection Ab to each well. Incubate 1 hr RT. 8. Aspirate and wash 5 times. 9. Add 100 μL diluted SAv-HRP to each well. Incubate 30 min RT. 10. Aspirate and wash 7 times (with 30 sec. to 1 min soaks). 12. Add 50 μL Stop Solution to each well. Read at 450 nm within (30 min with λ correction 570nm. Chalcones are known to possess antimicrobial efficacy since ancient days, they are naturally occurring in flavonoid family with widespread distribution in vegetables, fruits, spices and tea and are found in a variety of plant species. They could be chemically produced without difficulty, they consist of open-chain flavonoids in which two aromatic rings are connected by a three carbon a, b-unsaturated carbonyl system. Chalcones have been reported to possess many pharmacological activities, including anti-inflammatory, immunomodulatory, antifungal, anticancer, antioxidant, antibacterial, and antimalarial properties. In the lack of safe and effective chemotherapeutic agent we evaluated CSIR-CDRI, in lab synthesized chalcones series against the in vitro model of visceral leishmaniasis. Five synthetic compounds of this series were evaluated against the promastigotes stage of Leishmania donovaniparasite. These compounds were initially evaluated at two concentrations i.e. 100 and 50 μM. Four out of five showed >90% percent inhibition at 100 and 50 μM concentrations, further they were evaluated against the amastigotes stage, at seven concentration in order to calculate their IC50. All four compounds showed dose dependent killing of Leishmania amastigotes, as represented in table all four compounds were active at <10 micro molar concentrations and at 25 μM concentration 100% killing of Leishmaniaamastigotes was observed. Out of four active compounds, S012-0975 and S012-0977 showed best IC50 of 1.06 and 1.45 respectively. A chemotherapeutic drug might have efficacy due to its toxicity and it might kill host cells along with the parasite, so in order to check its cytotoxicity, host cell macrophages were treated with seven different concentrations of these synthetic compounds. CC50 was evaluated by MTT assay and it was found that compound S012-0977 had very less CC50 value of 32.8 μM, and other three compounds exhibited CC50 of >100 μM. Our results demonstrated that these chalcone derivatives were active in vitro with very less cytotoxicity on host cell macrophages. The commendable in vitro efficacies of chalcone derivatives motivated us to look for their efficacy in vivo model also (Balb/c mouse model). L. donovani infected Balb/c mice after infection checking on day 15 was treated with 2 mg/kg dose given via intra peritoneal route for five days. On day seven after last dose of treatment all mice were sacrificed for their liver and spleen parasitic burden. Dab smear of liver and spleen tissue were imprinted on microscopic slides and stained with Giemsa stain. The microscopic evaluation of giemsa stained slides showed marginal efficacy of chalcone derivatives. Only compound S012-0975 showed >90 % inhibition in survival of amastigotes. S012-0975 was chosen for analysis of production of Th1/Th2 cytokine, ROS and NO. One rational approach in Leishmania chemotherapy is to modulate the immune response to overcome the negative control systems and to boost the positive killing responses. In order to gain information concerning the immunomodulatory property of chalcone derivative on parasite and the infected cells following experiments were performed. Active VL infection is characterized by down-regulation of Th1 immune response and up-regulation of negative feedback signals, such as IL-10 and TGF-β. Activation of infected macrophages is mandatory to kill the intracellular parasites through elevated levels of reactive oxygen or nitrogen metabolites. This macrophage activation occurs through the production of cytokines, most critically IL-12. Treatment of S012-0975 (25 μM) in L. donovani-infected macrophages led to a marked generation of NO (12.3+1.4 μM) after 48 h post-treatment, we also estimated the generation of ROS in cells, 48 h after infection in J774.A1 macrophage treated with S012-0975 25 μM. S012-0975 treatment showed 5.7 fold induction of ROS generation, compared with corresponding infected controls. Significantly enhanced generation of ROS and NO in S012-0975 treated macrophages suggest that upregulation of Th1 cytokines is associated with production of reactive arsenals for the killing of parasite inside host macrophage. Combination therapy help to delay the emergence of resistance and to increase the therapeutic lifespan of the respective drugs as has been seen for diseases like malaria, tuberculosis, and HIV. Finally, combination therapy could improve treatment efficacy for complicated cases, such as patients coinfected with HIV, for whom treatment outcomes with monotherapy have been consistently poor (Griensven et al. 2010). Results of combination therapy of S012-0975 with miltefosine are presented in Figure 3. S012-0975 given at 0.5 mg/kg, intra-peritoneally for five days showed an efficacy of 59% and mice treated with 20 mg/kg of Miltefosine given oral for five days showed 56% inhibition in survival of amastigotes. However, when S012-0975 was given with a subcurative dose of miltefosine, parasite inhibition increased from 59% to 95% (p<0.001) interestingly, the effectiveness of this combination was similar to that of the curative dose (20 mg/kg×5 days) of miltefosine (90.2%). Increasing reports of treatment failure with pentavalent antimonials from the Indian subcontinent have raised the issue of acquired drug resistance. This concern now extends to miltefosine because of its long half-life and susceptibility to develop resistance with a single point mutation. The WHO has classified the disease as a major tropical disease. An effective vaccine is not available and the chemotherapy is the merely effective way for treat visceral leishmaniasis. Currently, the therapy is toxic, costly and the resistance has appeard as a serious problem, and has compelled the hunt for new antileishmanial agents. Aiming to achieve such kind of potential anti-leishmanial chemotherapeutic agent, we have selected four chalcone derivatives as they are well known for broad spectrum anti-parasitic activity for their in vitro and in vivo evaluation in the experimental model for visceral leishmaniasis. The efficacy of these compounds was compared with the standard anti-leishmanial drug Miltefosine. Host immune response has a direct effect on the effectiveness of chemotherapy for leishmaniasis and one of the chief complications for the chemotherapeutic management of VL is the inhibited immune function exhibited by patients. thus, augmentation of protective immune function in the infected host by means of immunomodulatory agents is necessary for conquering immunosuppression. Combination therapy using immune-modulator alongwith standard chemotherapeutic regimen is by now in practice for the cure of tuberculosis leprosy and malaria.